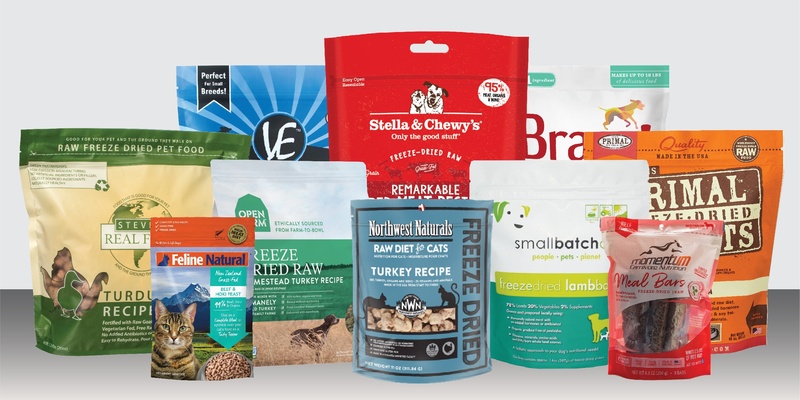 Alternative pet food brands pride themselves on being premium, all-natural and different from the rest. Alternative diets offer unique formulas that stand out from the standard canned or kibble varieties.Make sure that customers understand what makes these foods different and the benefits these foods provide to their pets. Make it easier for pet parents to shop for alternative diets in your store by separating them from the rest of the food you carry and putting them in their own section. There are many variations of alternative pet food diets ranging from freeze dried raw, dehydrated, air dried, and raw/frozen. Let’s take a look at how you can showcase them the best in your store! If a customer is interested in switching to an alternative diet then make sure you can answer all their questions about how the food is made, what it provides nutritionally, and how it is different from the kibble and canned diets they're familiar with. Hold training sessions for employees so they can be fully informed on the subject. There are many great resources to help you learn more online, and directly from the vendors. 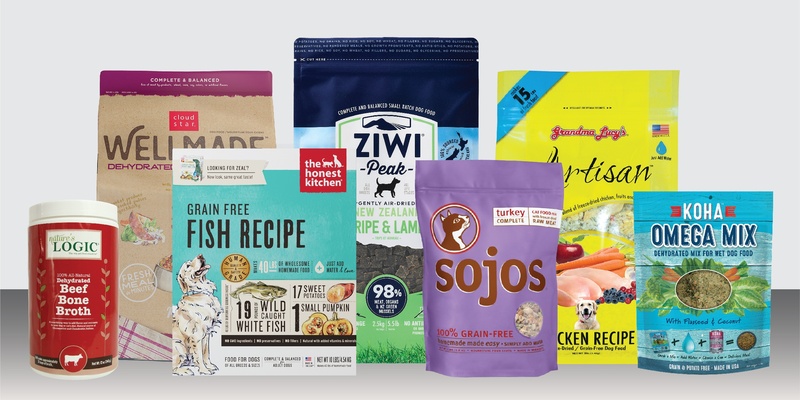 You and your employees can help guide pet parents through the alternative food aisle by being more informed on what makes alternative pet foods 'alternative'. Here are some basic facts on a few categories to get you started. Freeze dried pet food provides pet parents the quality of a raw diet with the convenience of a kibble. During the freeze drying process, raw ingredients are exposed to extremely low temperatures and pressure to remove all the moisture and seal the product tight. This process acts as a natural preservative for the food which keeps it free from chemicals or additives. These formulas can provide a complete and balanced meal for your pets with no need for any additional supplements or meal mix-ins. Frozen raw pet diets are not cooked in any way, and therefore they are able to retain the full nutritional value of their contents. The ingredients used to formulate raw diets can vary but consist mostly of meat, edible bones, and organs. Also, not all raw pet foods are complete and balanced, so if a customer decided to go with one of these options they may need to add ingredients to make it a nutritionally balanced meal. Frozen raw diets in combination with dehydrated foods can make for the complete and balanced meal a pet would need while also providing them something more enticing and palatable. 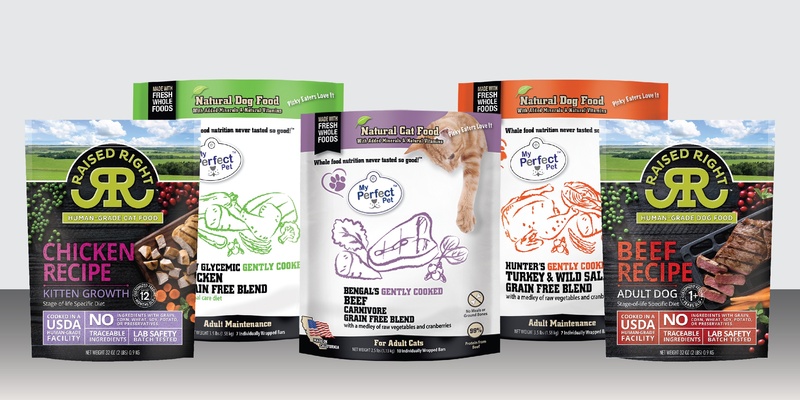 It is recommended to feed your pets raw food that is made in the U.S.A.
For those uncomfortable with handling raw food, but are interested in a simple, minimally processed diet for their cats and dogs, dehydrated pet food provides a safe solution. Dehydrated formulas are slowly cooked at a low heat to pull the moisture out, all while maintaining the taste and integrity of the ingredients, and without the use of chemicals. Air drying is a process that has been used for centuries to naturally preserve meats. Air dried pet food is made using an evaporation process that removes all moisture without the use of heat. Air drying eliminates bacteria like salmonella and listeria while locking in vitamins and sensitive nutrients and enzymes with minimal damage to the proteins. Both dehydrated and air dried foods can provide a complete and balanced diet to pets. Foods found in the refrigerated section of your pet store may be the solution for pet parents worried about preservatives, but don’t like the idea of handling raw food. Gently cooked pet food just like kibble is cooked but is much fresher than kibble or canned foods. The light cooking makes it so Refrigeration also preserves the full nutritional value of the food. Gently cooked foods can be a great option for introducing a raw diet to pets. My Perfect Pet and Raised Right have a variety of options you can offer your customers. You want new and repeat customers alike to be able to find their way around your store. As a pet specialty retail store you may be the only one in your community offering these unique diets, so help them easily find it when they enter your store. It would be best to place the non-refrigerated food as close to your freezer as possible. Research shows that about 67 percent of customers purchased a product because a sign caught their eye. By using a sign that may say something like, 'Fresh/Raw Diets' or 'Alternative Diets' customers can easily see exactly where they need to head when they enter your store. This A frame at the end of an aisle in a Kriser's Pet Store does a great job of catching a customers attention regarding alternative diets. Take advantage of shelf talkers when setting up your alternative aisle. Shelf talkers work as free employees around the clock. They can answer the most basic questions about certain products when you are not there to help. You can create your own shelf talkers or sometimes vendors will provide them for you upon request. Pro tip: Make sure to avoid putting too many signs on your freezer. You want customers to still be able to see the product inside clearly. 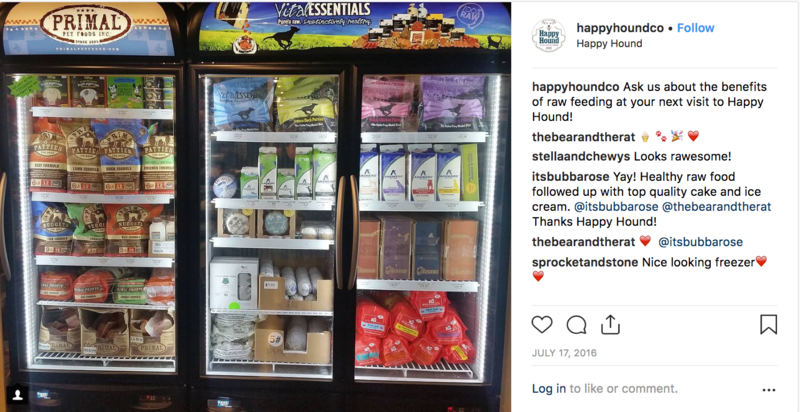 This freezer in the Happy Hound located in Lansdowne, VA is a great example of a freezer that is organized and free of too many signs making the customer's journey even easier. Many people are put off by the word "raw" and can be skeptical of alternative diets, so they won’t be as likely to purchase a bag of food without being sure their dog likes it. If you are able, offer trial size bags of your favorite brands. This way, pet parents can try out the food without committing to a larger bag. If their pet likes what you send home, you are very likely to get a repeat customer. 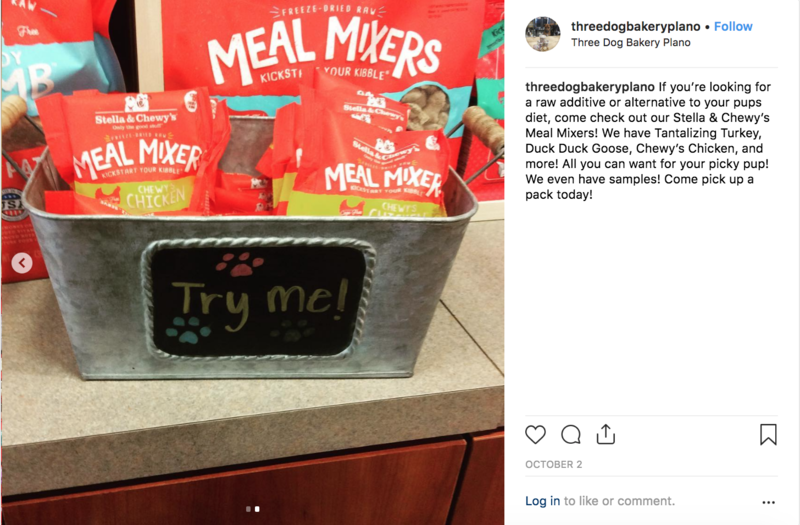 Three Dog Bakery in Kansas City, MO set up a small bucket with sample sizes encouraging customers to try Stella and Chewy's raw coated kibble. However, not every brand has sample size bags that you can offer to customers, so you’ll need to convince them to commit to a full-size bag. A great way to do this is by guaranteeing that if the pet does not like the food the pet parent can exchange it for another. Make a special table display or set up an end cap with some alternative options. Catch a customer’s attention when they first walk in. You want to try and get your customers to stop and take a moment to check out this food. Making a customer aware of alternative diets can be the first step towards them making the change for their pet. Pets Etc. 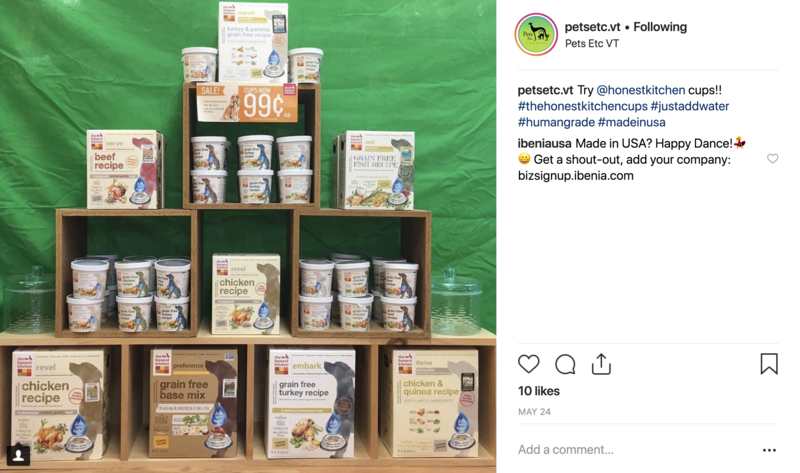 in Manchester Center, VT built an awesome display of The Honest Kitchen that is sure to catch a customer's eye and by sharing it on social media they were also able to promote their sale on the food. When creating displays or setting up your alternative food aisle consider what products might be best paired together. Food measuring cups hanging on clip strips or in a bin on an end-cap with alternative diets can help build a customer's basket. Another great option is to share on social media how getting something like a bowl cover or food scoop can make preparing alternative diet foods that much easier. 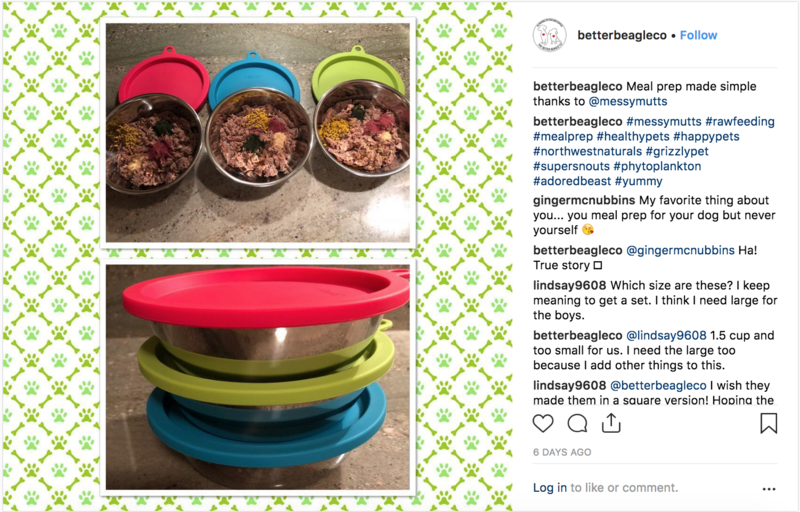 The Better Beagle Co. in Woodbridge, CT did a great job of showing how switching to an alternative diet for you pet can be just as easy as traditional kibble by meal prepping with Messy Mutts meal prep bowls. The unique formulas offered by alternative food brands is something you can highlight on your social media. Raw feeding preparation demo videos or artsy pics of a prepared food bowl can be a great way to capture the attention of customers who aren't quite sure what an alternative diet is. 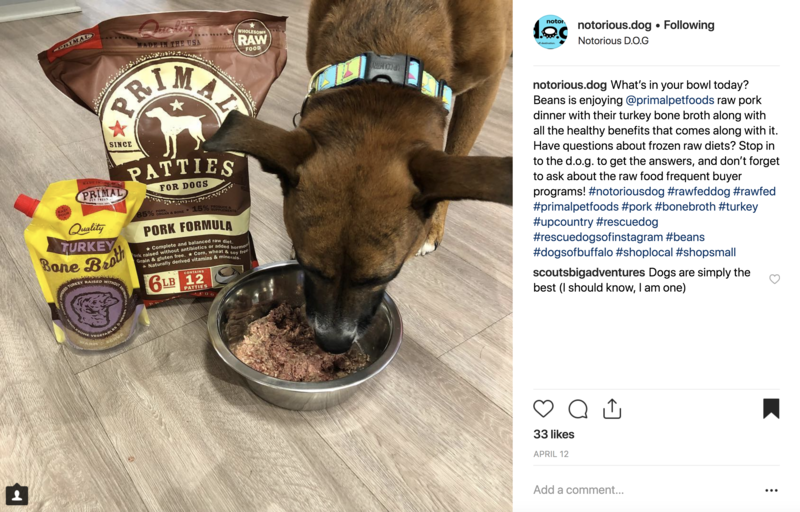 You can even share the result of an alternative diet meal and snap a pic of your pup chowing down. The store Notorious D.O.G. 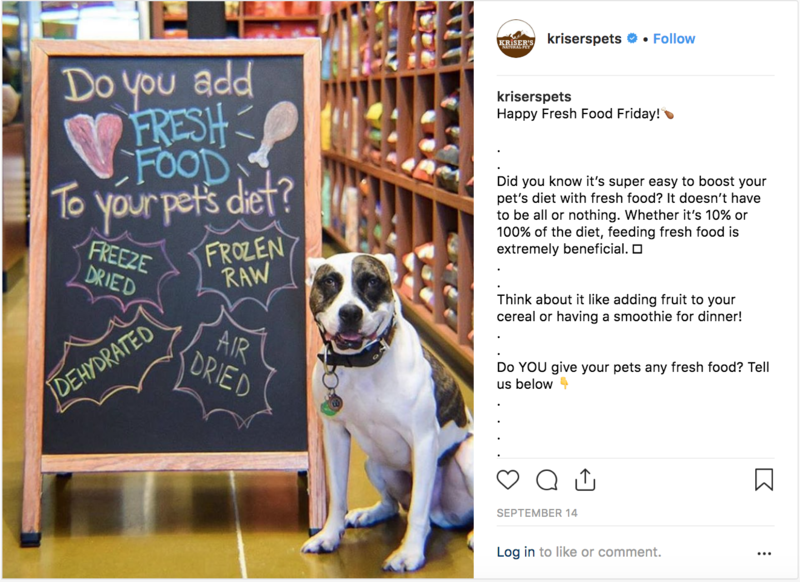 in Clarence, NY did a great job showing a pet enjoying some Primal frozen raw food and bone broth and also engaging their followers with the caption. A great way to showcase these products is by having experts come into your store to perform demonstrations and talk to your customers. Consider contacting your vendor rep and see if they would be willing to come to your store and perform a demo. Depending on the vendor you can often choose which days and times would be best. Share on social media when reps will be in your store, so interested customers can stop in to learn more. 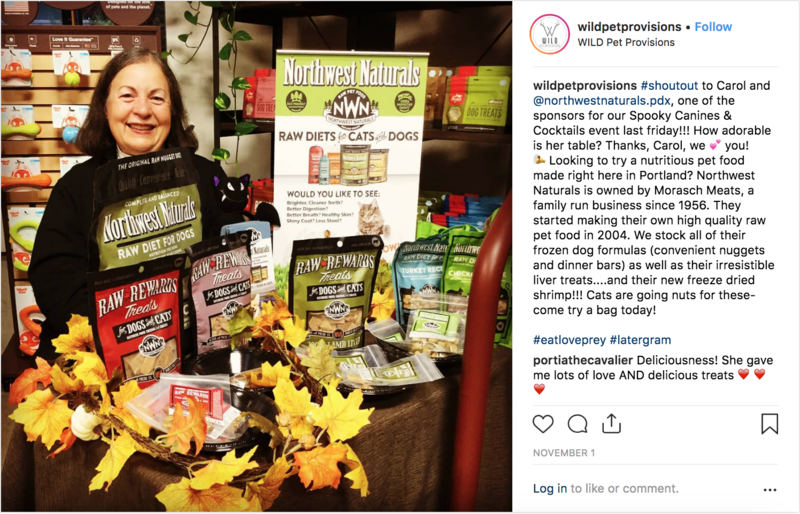 Wild Pet Provisions in Portland, OR had a rep from Northwest Naturals as one of their sponsors a Halloween event. Customers attending were able to learn more about the product and get some samples to try out. This can be an excellent way to engage customers and help them get to know some of the brands you carry. The reps may even have some free samples or giveaways you can use to get customers in the door and in your alternative aisle. Words like raw, freeze-dried, and dehydrated can be intimidating to pet parents that have always fed their pet kibble and wet food. 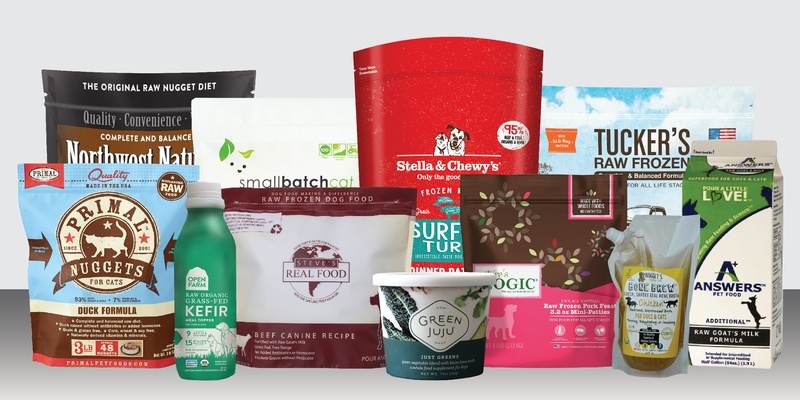 By incorporating things like signage, demos, and shelf talkers into your marketing strategy you can help pet parents feel more comfortable in the alternative food aisle which in turn will generate more sales for you. Like these ideas? Let us know if you decide to use any of them and share it with us on our social media pages, or comment below!